A study led by PNNL shows that hurricanes intensify more quickly now than they did 30 years ago. 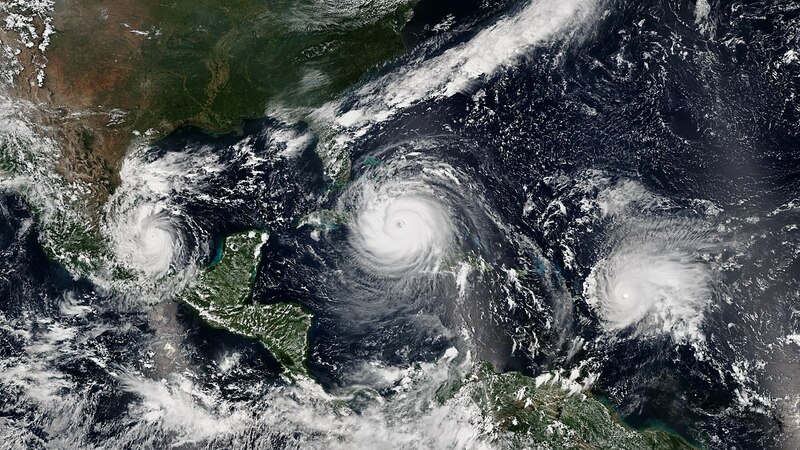 Hurricanes like Irma (center), and Jose (right) are examples of these types of hurricanes. Hurricane Katia is visible on the left. RICHLAND, Wash. — Hurricanes that intensify rapidly — a characteristic of almost all powerful hurricanes — do so more strongly and quickly now than they did 30 years ago, according to a study published recently in Geophysical Research Letters, a journal of the American Geophysical Union. While many factors are at play, the chief driver is a natural phenomenon that affects the temperature of the waters in the Atlantic where hurricanes are powering up, according to scientists at the U.S. Department of Energy's Pacific Northwest National Laboratory and the National Oceanic and Atmospheric Administration. They found that a climate cycle known as the Atlantic Multidecadal Oscillation or AMO is central to the increasing intensification of hurricanes, broadly affecting conditions like sea temperature that are known to influence hurricanes. Last year's lineup of powerful storms — Harvey, Irma, Jose and Maria — spurred the scientists to take a close look at the rapid intensification process. This occurs when the maximum wind speed in a hurricane goes up by at least 25 knots (28.8 miles per hour) within a 24-hour period. It's a rite of passage for nearly all major hurricanes, including the big four of 2017. The team, comprised of Karthik Balaguru and Ruby Leung of PNNL and Greg Foltz of NOAA, analyzed 30 years' worth of satellite hurricane data encompassing 1986 through 2015. Information came from NOAA's National Hurricane Center and the U.S. Navy's Joint Typhoon Warning Center. Consistent with other studies, the scientists did not find that rapid intensification is happening more often nowadays. But the scientists also looked closely at just how much the storms are strengthening. They found a sizeable jump in the strength of fast-growing storms — the storms are getting more powerful more quickly within a 24-hour period than they were 30 years ago. The team found that the average boost in wind speed during a 24-hour intensification event is about 13 mph more than it was 30 years ago — on average about 3.8 knots (4.3 mph) for each of the three decades studied. The amount of heat available in the uppermost layer of the ocean, known as the ocean heat content. The warmer the upper ocean, the more powerful a hurricane can become. Wind shear: The less the vertical wind shear — the difference in the direction and force of the winds at the surface compared to several miles into the air — the more powerful the hurricane can become. The team found that the biggest factor explaining the increasingly rapid intensification is the AMO. The result comes in part from analyses using 16 separate climate models to isolate the impact from global warming. "This was a surprise, that the AMO seems to be a bigger influence in rapid intensification than other factors, including overall warming," said Balaguru, the first author of the paper. The AMO governs how the temperature of the waters in the North Atlantic cycles between warmer and cooler, with each period typically lasting a decade or more. The cycling occurs for reasons scientists don't completely understand, but it has broad effects on the environment. For example, it plays a big part in determining the heat content of the oceans, an important factor powering hurricanes. The AMO has generally been "positive" — causing warmer waters — since the late 1990s. Balaguru noted that while rapid intensification historically has occurred more often in the western Atlantic, that's not where the team found the increasing strength of the last 30 years. Rather, the phenomenon is strengthening more in the central and eastern Atlantic, especially to the east of the islands of the Lesser Antilles, which includes the Virgin Islands and Saint Kitts. That's the same area where the AMO creates warmer waters and boosts ocean heat content, in the central and eastern Atlantic. That's exactly the alley where hurricanes Irma, Jose and Maria powered up rapidly last year. It's a proving ground of sorts where many of the most powerful hurricanes strengthen dramatically. Balaguru notes that teasing out the effects of the AMO from broader effects of global warming was beyond the scope of the current study but is a focus for scientists. The work was supported by the Department of Energy's Office of Science.